This weekend was such beautiful fall weather. Weather I wish I could have every day -- sunny and crisp enough to cool your nose and put a little pep in your step. I saw turtlenecks and corduroy and that special 5 o'clock yellow light as the sun leaves our city sky and huge building shadows stripe our concrete streets. What is fall if not football, leaves and pumpkins? My momma texted me the picture below when she was out pumpkin picking with my grandmother in Rhode Island this weekend. I admit, with the ominous sky, its a little Blair Witch Project, but that aside, how great are these colors?? I wish she had set my little grandma next to it, because she said it was about 15 feet high which you definitely cant tell. 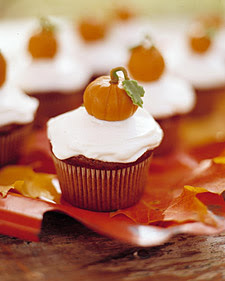 This inspiration sent me searching online for the above picture from Martha Stewart . Took me A WHILE to find but I knew it was out there. 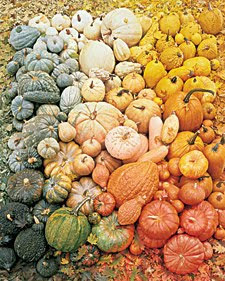 I want a wall in every color, a squash in every soup, and a pumpkin on every table and stair. How amazing is this palette?? 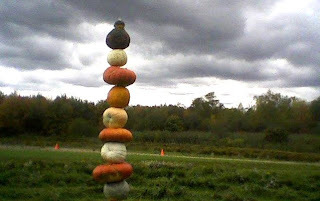 Along the way I found lots of other pumpkin ideas. A very few of which are below. 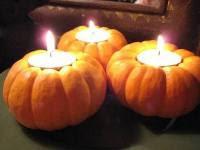 Here is a simple idea for any table you set. I found them on about.com and they require zero creative talent. 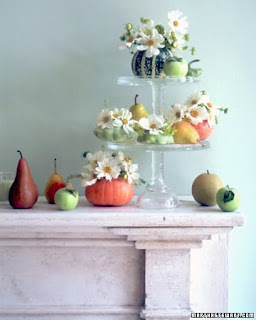 Ive done the same thing with small apples, and they look adorable on a set table. These ones, also Martha look a bit more difficult... But I think a more simple version could be done. I love how sophisticated and antique looking a traditionally child craft can become. And lastly... 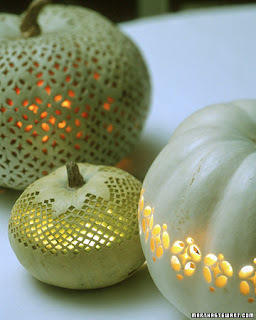 I came across a lot of pumpkin-as-vase pictures, and wasn't very impressed with many. These gourds, with white cosmos and chartreuse lady's mantle got me though. So light and feminine, and again, very simple.